One general rule we’ve discovered with bikes and cycling gear is that you get what you pay for. High price usually means high quality. Therefore, we were shocked and excited to discover that the Race Face Chester pedals somehow turned this rule on its head. At a mere $50, the Chester offers a lightweight, durable, grippy, and attractive little package. The pedal is made out of nylon which accounts for the light weight and low price. We were delighted to find that this material also makes for an attractive and durable pedal. The Chester sustained testing on rocks, ice, snow, and mud and came out looking as beautiful as always. 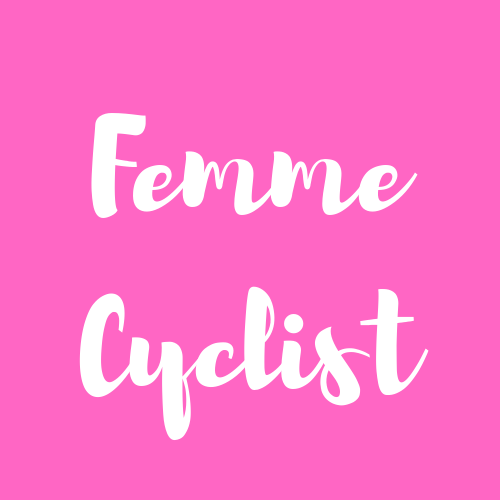 While I’m generally an SPD kinda gal and run clips on both my primary mountain bike and my road bike, there are three situations in which I prefer a flat pedal. The first instance is for fat biking in the snow. In fact, I chose the Race Face Chester specifically for use on my Framed Minnesota. 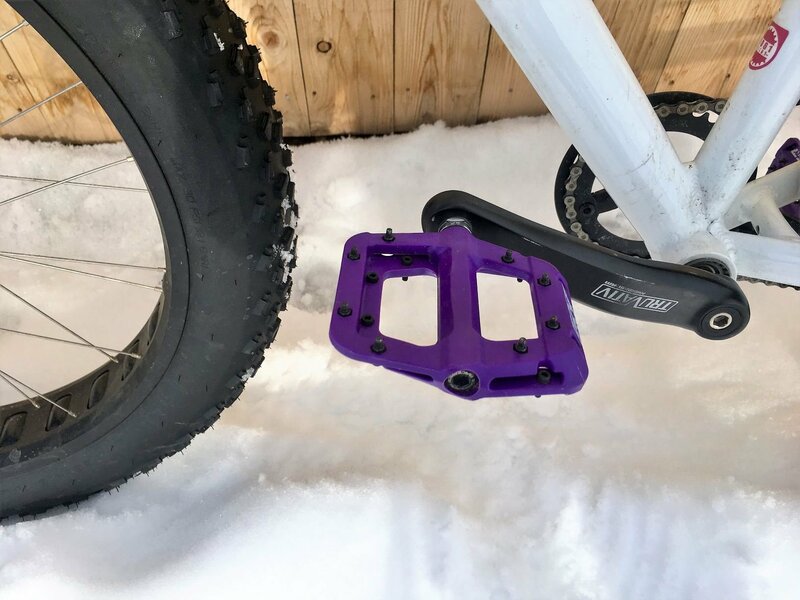 I chose to put a flat pedal on my fat bike because I didn’t want to deal with trying to clear ice and snow from clips nor did I want to invest in a special pair of boots just for fat biking. The second situation where I really like flat pedals is in technical terrain where I’m going to be clipping in and out of my pedals a lot. If I’m running an SPD pedal on my bike, I tend to clip out when I ride thru a section where I’m not confident. Of course, this means I have a pretty crappy platfrom from which to pedal and balance. A flat pedal allows me to keep my feet planted firmly on the pedal while tackling stuff that’s a little outside my comfort zone. The third time a flat pedal comes in handy is on my commuter bike. Although I often ride long distances on the bike and like the efficiency of clipless pedals, I also like being able to where any shoe with the bike and not be limited to a bike shoe. One of the most attractive things about the Race Face Chester is the $50 price tag. This makes it cheap enough to buy a pair for each bike, or painless to put in a “second” bike like a commuter or fat bike. That said, I’d put the Chester on my primary mountain bike too. (And probably will come spring). It is as good as many flat pedals twice it’s price. Which begs the question, why spend more when you can do so good for cheap? I’m not embarrassed to admit that I often pick smaller components (pedals, grips, cable housing, etc), based on color. It’s fun to accesorize! That’s part of the reason that I love the Race Face Chester. Not only do they come in a variety of colors, they are nice bright colors that continue to look good even with heavy use. 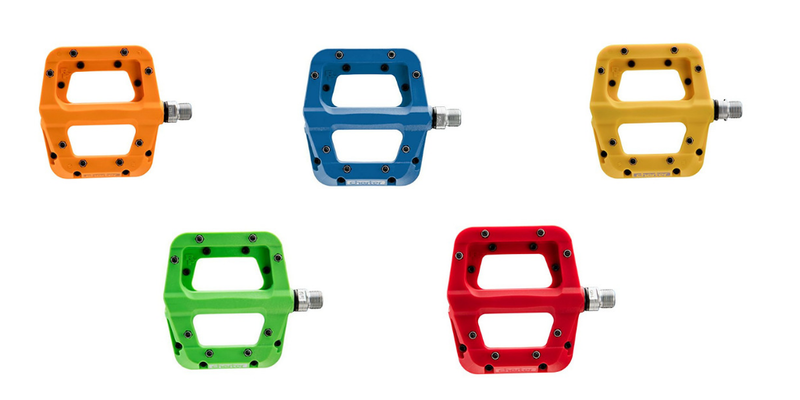 Unlike many metal flat pedals, the Chester’s still look good after crashes and pedal strikes. The nylon material doesn’t show scratches much, making these a good pick for people who care about asthetics. There are 8 pins on each side of the pedal and they are easily adjustable via a tiny allen wrench. If you want less traction (say for biking around town in sandals), then you can back out the pins a bit. I found that I liked the pins screwed all the way in, and with my boots, I have excellent traction even when the pedals are icy and snowy. Even on the upside of my pedal stroke, I feel like I have contact with the pedal and that I’m not losing much if any efficiency compared to an SPD pedal. rings or mushrooming heads. 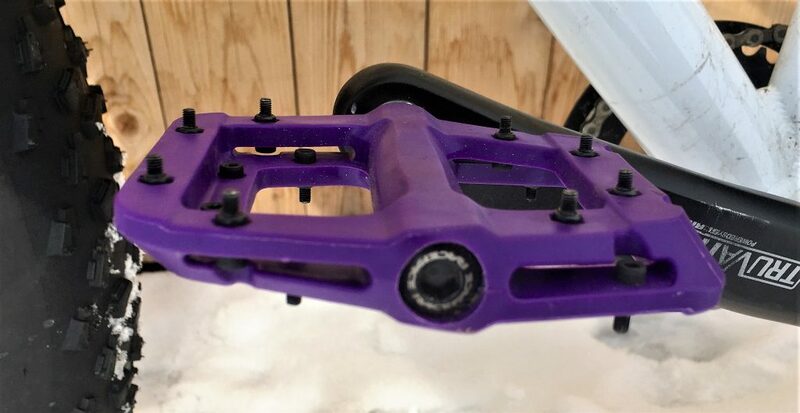 If you are planning on using the pedals for agressive DH or Enduro riding, these might not be the pedals for you, but for most of us, the pins are more than adequate. In fact, the only thing I didn’t like about the Chester pedals is that one day while dismounting in a technical icy spot, the pedal caught the back of my calflf and tore a whole in my brand new, day-old cycling leggings. Single sad tear! Of course, this isn’t a criticism of the Chester necessarily but a criticism of flat pedals with metal pins in general. Sooner or later you’re going to come in contact with the pins, and it probably isn’t going to be pretty. You’re lucky if it is your brand new leggings and not your flesh! It’s not often that I declare love, but for me, the Race Face Chester is a pretty perfect match. It’s pretty, durable, functional, and cheap. What’s not to love? Many of the links on this site are affiliate links, meaning that if you click on a link and make a purchase, we may get a percentage of the sale.